Hopes for the safe release of 22 South Korean hostages kidnapped in Afghanistan were kept on tenterhooks Friday, amid conflicting reports of a Taliban deadline being passed without word on their fate or progress in negotiations. Afghan officials remained upbeat about the chances of freeing the hostages without further bloodshed, despite an ultimatum given Thursday by a purported Taliban spokesman that the captives could be killed if their demands were not met by noon Friday. However, Mullah Mohammed Sabir, the Taliban's governor for Ghazni — not recognized by Afghanistan's government, which has its own governor in the province — told CBS News late Thursday night that the group had not set a new deadline for a deal with the government. He said the hostages fate was dependent on the negotiations being carried out with the government and South Korean officials. 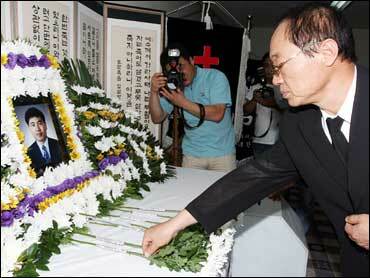 Previous deadlines given since the South Koreans were seized on July 19 had passed without incident. One of the original 23 captives was shot to death, though the reasons are not clear. "We hope we will have a good result, but I don't know if they will be released today. I don't think they will be," Shirin Mangal, a spokesman for the governor of Ghazni province where the Koreans were taken, said Friday. Meanwhile, Taliban commander Mullah Abdullah told CBS News Friday that the one male hostage who had been suffering from unidentified health problems was "back in health." Abdullah said all the captives were in good health, but not necessarily good spirits. "Obviously, they are prisoners, and not happy." In an exclusive interview with CBS News, one of the female hostages said many of her co-captives were ill. The woman, who identified herself as Yo Cyun-ju, pleaded for the Afghan government to reach an agreement to win their release. Yo described the conditions of her captivity as "dreadful" and "exhausting". Abdullah also reiterated that no new deadline had been imposed on the negotiations to secure the hostages' release. The militant commander added that the South Koreans were being fed well, and that some of the Taliban members present were trying to learn Korean, to keep the captives busy. A South Korean presidential envoy was due to arrive Friday for talks with Afghan President Hamid Karzai and other top officials on the crisis. No breakthrough came in a round of telephone calls late into Thursday night that resumed Friday, officials said. Negotiators were struggling with conflicting demands made by the kidnappers, including the release of Taliban prisoners and ransom money. In Seoul, a South Korean Foreign Ministry official, speaking on condition of anonymity because of the matter's sensitivity, said the captives were still believed to be safe and that officials were trying to get medicine and other items delivered to them. Baek Jong-chun, a senior South Korean official, was expected to meet Karzai and other high-level officials to discuss specific measures to free the hostages, the official said. Meanwhile, local officials and villagers in souther Afghanistan reported Friday that dozens of Taliban militants and civilians had been killed in a clash between insurgents and NATO and Afghan troops. They said the fighting started Thursday night in a village in Helmand province, with NATO forces telling people to evacuate their homes. A district chief says airstrikes killed at least 50 Taliban but also 28 civilians, with the fighting continuing today. NATO officials say they don't have any information about the reported incident and are looking into it. Local tribal elders and religious clerics who have respect among the people of the Qarabagh district where the Koreans were taken have been conducting negotiations by telephone with the captors for several days. "There are still a lot of problems among them," Qarabagh police chief Khwaja Mohammad Sidiqi said Friday. "One says, 'Let's exchange them for my relative,' the others say, 'Let's release the women,' and yet another wants a deal for money," he said earlier. Qari Yousef Ahmadi, who claims to speak for the hard-line Islamist Taliban, on Thursday reiterated a demand for the release of Taliban prisoners, and a threat to kill more of the hostages. One of the group of abducted Koreans, 42-year-old pastor Bae Hyung-kyu, was found slain with multiple gunshots on Wednesday in Qarabagh. "If Kabul administration does not solve our problem ... then we do not have any option but to kill Korean hostages," Ahmadi said by phone from an undisclosed location. Ahmadi has given some information in the past that proved to be incorrect, though he is believed to have direct links to Taliban leaders. "The Taliban are not asking for money. We just want to exchange our prisoners for Korean hostages. ... When they release the Taliban, we will release the hostages," he said. The Taliban at one point demanded that 23 jailed militants be freed in exchange for the South Koreans, though it is not clear how many militants the Taliban want freed or which ones. Ahmadi said the hostages were being held in small groups in different locations and were being fed on bread, yogurt and rice. The South Koreans, including 18 women, were kidnapped while on a bus trip through Ghazni on the Kabul-Kandahar highway, Afghanistan's main thoroughfare. Their church said the abductees were not involved in any Christian missionary work in Afghanistan, and had provided only medical and other volunteer aid to distressed people in the war-ravaged country. It said it will suspend some of its volunteer work in Afghanistan. In Washington, U.S. State Department spokesman Sean McCormack said it supports efforts to free the South Koreans. "What should happen is that these people should be released, unconditionally, immediately and unharmed, back to South Korean authorities, so they can return back to their families," he said.